One of the topics that comes up a lot when I’m coaching new school owners is the issue of staffing in the early stages of their martial art school’s growth. Many school owners seem to struggle with the financial issues associated with hiring staff members to help them run and grow their schools. So, they try to find creative ways to save money while solving their staffing shortfall; unfortunately, often these creative solutions can potentially become a liability to them down the road. In this article, I’m going to explain the most common reasons why martial art school owners consider using free labor. And, I’m also going to examine the potential legal and business problems that can arise from some of the more “creative” solutions to staffing shortfalls that are commonly practiced in the martial arts industry. Finally, I’m going to present you with some solutions that will help you avoid potential legal and business issues while alleviating your staffing challenges. For most new studio owners, staffing versus school growth can be a real Catch-22. Once you hit a certain point in your enrollment numbers, it simply becomes impossible to handle everything yourself. Typically however, budgetary concerns will lead to a hesitation on the part of the new school owner to hire someone to help them run their studio. Yet, in some instances it’s not necessarily a shortage of cash that causes the school owner to hesitate when it comes to hiring employees. In many cases, it’s greed. The school owner simply does not want to spend the money to hire staff, especially not when they’ve witnessed their own instructors getting free labor from their students in years gone by. In fact, they might have worked in their instructor’s school for free in years past, so perhaps now they expect to enjoy the same arrangement with their own students. Or, maybe they’ve just been told by other martial art school owners that there’s no reason to hire help, not when you have a large pool of willing volunteers (students) close at hand. I mean, it would seem to be common sense that, if you can get the help you need without having to pay for it, that you should do so. And, if a school owner has witnessed another more successful instructor who has profited by utilizing just such an approach to staffing, they are probably more likely to consider implementing a similar strategy in their own business. Tax and Legal Issues – For starters, it is illegal to pay an employee covered under the Fair Labor Standards Act less than the federal minimum wage. So, accepting “free” volunteer labor for your for-profit business is a big no-no. Now, you might think that because your business does less than $500,000 a year in revenue that you’re exempt, but you would be wrong. Over the years, the courts have ruled that virtually all businesses are subject to the FLSA. Additionally, you should note that the FLSA also governs many child labor issues… so in all likelihood that “STORM” team that helps you run your special events and classes is violating child labor laws concerning compensation, ages, hours, and more. Yes Bartering Is Legal, But… – So, you might think that bartering volunteer hours or labor in exchange for tuition or discounts makes it legal. And, it does… but the IRS still wants their cut. That means you still have to track what the cash value is of the exchange of goods or services, and then you have to report it just like any other payroll expenses on the appropriate schedule or form on your yearly tax return. Moreover, you also have to 1099 the person receiving the discount or benefit, if those benefits total more than $600 in a given year. Plus, Are They Really Contract Employees? – You see, you only 1099 contract employees. So what’s the difference between a regular and a contract employee? It’s tricky, but the rules more or less revolve around the nature of your relationship with regards to the work and employment. Chances are good that, if you tell those “volunteers” who are bartering in exchange for tuition that they have to be at a certain place at a certain time to do a specific task… then the IRS is going to consider them to be regular employees. So guess what? That means they’re subject to regular income withholding, and also that you’re subject to employment taxes (federal and state level, bub). And, the penalties for failing to report and withhold said taxes can be substantial. So, are you beginning to see what a mess this can be? Seems like it’s almost easier to just write someone a check each week, track their taxes and withholding in QuickBooks , report it, pay it, and call it a day. But, the legal and tax issues aren’t the only reasons for you to consider just hiring somebody outright to help you run your studio. As an instructor, your every action is constantly under scrutiny. So, by availing yourself of “free” volunteer help, you run the risk of giving the appearance of taking advantage of your students. All it takes is for one person to feel like you’re taking them for granted for you to look like a putz to your clients. Don’t kid yourself – people talk, and they’re talking behind your back on an almost constant basis. It’s been said that character is what you do when no one is around, but reputation is what people say about you behind your back. Reputation is everything in business, and it’s important that you don’t risk ruining yours by taking shortcuts in how you hire and remunerate your staff. So, my advice to you is to do what I’ve always done, and just pay your workers a fair and competitive wage. But What’s A Broke Martial Arts Instructor To Do? This is going to sound obvious and unhelpful, but for starters stop being broke. I know, “duh” – but hear me out. There are a ton of things you can do to come up with the funds necessary to have a payroll budget. 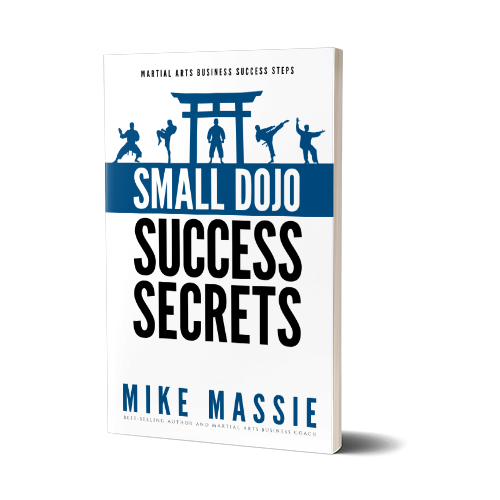 The first step is to set your school up so your overhead is low in the first place, which means following Small Dojo Big Profits guidelines and principles in your business. Get the book, read it, and apply it in your business today. Or, if you’re less of a reader and more of a visual and auditory learner, join MAbizU.com and start going through the 100- and 200-level courses immediately. Second, you need to learn how to market your martial art school effectively and sell martial arts memberships efficiently. The former means that you have enough leads so that you’re never desperate for money, and the latter means that you don’t squander those leads by chasing them off before they enroll. Learning to do those two things well will solve 90% of your cash flow challenges in your school, before they happen (note: the other 10% is budgeting). Also, you need to learn how to keep the students you have and maximize the profit you make from those students in an ethical fashion. Doing so will fill the gaps in your income and allow you to easily find the money to pay your staff members each and every month, without feeling like you’re taking food off your own table to do so. Finally, if you’re at the point where you feel that you can’t grow your school without hiring some help, it’s probably best to first hire someone to answer the phones and enroll students while you’re on the floor. Hire someone to mind the front counter for a few hours a night while you’re teaching, before you hire someone to replace you on the floor. This may seem backwards to you, but it’s easier to find someone with administrative skills that it is to find someone who is a qualified instructor. So, it’s often the quickest and cheapest way to get the help you need fast. And if you don’t have a clue how to train people to replace you on the floor, check out the staffing lessons in the 101 and 201 courses on MAbizU.com. Or, read my book (available on Amazon) on hiring and training staff members for you martial art school. That’s it for this article, and I hope by now you can see why I say that “free help” isn’t ever really free. If you have questions or comments, please feel free to post them below.